Painted Turtle Book, 9780814335017, 168pp. Tom Weschler spent more than ten years from the late 1960s through the 1970s in the Bob Seger camp, working as tour manager and photographer during Seger's hard-gigging, heavy-traveling, reputation-making early days. Weschler's behind-the-scenes photographs document the frustrations and triumphs of recording, performing, songwriting, and building the Seger empire before the breakthroughs of Live Bullet and Night Moves. Travelin' Man collects Weschler's early photos with additional images leading into the present. Weschler and award-winning music journalist Gary Graff annotate the images with Weschler's recollections of the events and Graff provides additional background on Seger's career in an introduction, timeline, and cast of characters section. Weschler's photographs and stories pull back the curtain on seldom-seen aspects of Seger's career, including time in the studio recording Mongrel, early struggles to get radio airplay, and small shows at schools and shopping malls. Weschler captures Seger's personality on stage and at home and reveals the colorful personalities of those people he worked and performed with, including Alice Cooper, Bruce Springsteen, Glenn Frey, and KISS. He takes readers inside Seger headquarters in Birmingham, Michigan, and practice space in Rochester, Michigan, introducing them to renowned manager Punch Andrews and the various members of Seger's bands. Weschler's photos feature highlights like Seger's show at the Pontiac Silverdome in 1976, his first gold record in 1977, the first meeting between Seger and Bruce Springsteen in 1978, and Seger's induction to the Rock and Roll Hall of Fame in 2004. Travelin' Man also contains art from eight Seger album covers that Weschler designed, a foreword by John Mellencamp, an afterword by Kid Rock, and a comprehensive discography. 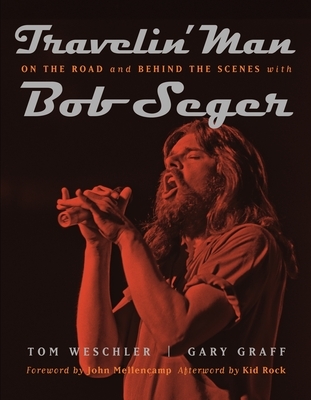 Seger fans and readers interested in music and biography will enjoy the one of a kind story in Travelin' Man. Tom Weschler is a photographer living and working in metropolitan Detroit. He has been photographing musical events since 1964 when at age fifteen he photographed the Beatles first American television appearance on The Ed Sullivan Show in his bedroom.Gary Graff is an award-winning music journalist based in Detroit whose work appears regularly in numerous publications, including Billboard, the New York Times Features Syndicate, UPI, the Oakland Press, Revolver, Red Flag Media, and GrokMusic.com. He also reports on music news for WCSX in Detroit, WHQG in Milwaukee, and Radio 106.7 in Columbus, Ohio. He is the founding editor of the MusicHound Essential Album Guide series and editor of The Ties That Bind: Bruce Springsteen A to E to Z.